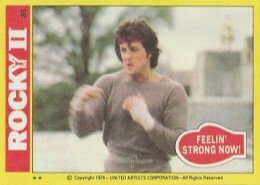 It's reasonable to understand why there was never a set of trading cards when the original Rocky released. It wasn't on a lot of radars, especially when it came to licensing and bubble gum cards. A couple of years, a massive box office haul and a ton of awards later came the inevitable sequel. And with that came the deals and merchandise, including 1979 Topps Rocky II trading cards. The main set has 99 cards, which is standard for the time if not slightly on the large side. It's a spoiler-heavy checklist that does a good job of encapsulating the film in which Rocky, not so much an underdog anymore, gets a second chance against the flamboyant champ, Apollo Creed. 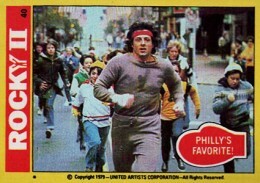 1979 Topps Rocky II card fronts have an old-school feel to them. Unlike 1991 Fleer Baseball, the bright yellow border works. The film's logo is splashed across the card like a banner with the card number alongside it. Images take from the film's action, both inside the ring and outside it. The card's caption is included inside a red boxing icon. Backs come in two types. The ones with write-ups continue with the yellow border. A silhouetted Rocky has his glove out. The ensuing "smash" makes a red box with the summary in it. These cards also have another glove icon with the card number. Other backs take a basic puzzle approach. In addition to the base set, 1979 Topps Rocky II also has 22 Stickers. Inserted one per pack, they recycle images from the main set and put them inside a die-cut glove. Stickers have a black border and are blank on the back. Like a lot of sets from this era, the stickers can be easier to find because they were also offered in massive vending cases that had no base cards. Even with the larger-than-average Sticker checklist, one case of 4,500 stickers makes a lot of sets. 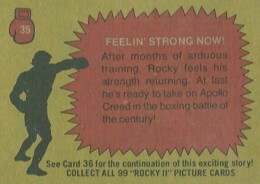 Although Rocky III never got a set, Topps jumped back in for Rocky IV. They also included a very limited number of Sylvester Stallone buyback autographs from both sets in 2013 Topps 75th Anniversary. These are original cards signed by the actor. 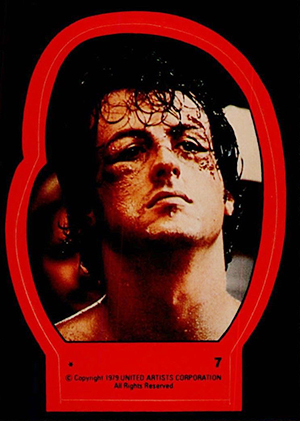 Today, 1979 Topps Rocky II does decent on the secondary market. It's still fairly readily available but not as common as a lot of other sets. This has meant that prices have stayed out of the gutters but it's still affordable, even for professionally graded cards and unopened boxes. As far as movie sets go, this one has more crossover appeal into the sports realm thanks to its boxing theme and the iconic stature the Rocky Balboa character has today. 99 cards. Shop for sets on eBay. 14 Don't Mess with the Rock! 22 "You Can Do It!" 38 Nothing Can Stop Me Now! 59 A Left to Rocky's Chin! 65 In Over His Head! 69 Round Nine Coming Up! 70 Bruised But Not Beaten! 73 "I Won't Give Up!" 78 Both Men Are Down! 79 The Champ's Been Floored! 83 Hand in There, Rocky! 84 Down for the Count! 87 Stumbling to His Feet! 99 "We Did It, Adrian!" 15 Don’t Mess with the Rock! 1979 Topps Full 36 Count ROCKY 2 II REMATCH TRADING CARDS Wax Box "YO ADRIAN!"